It was a learning experience to figure out the exact proportions to get the right consistency, but I'm proud to share my final recipe! These are super simple, with few ingredients and freedom to add any ingredients that you see fit or that your pet loves! 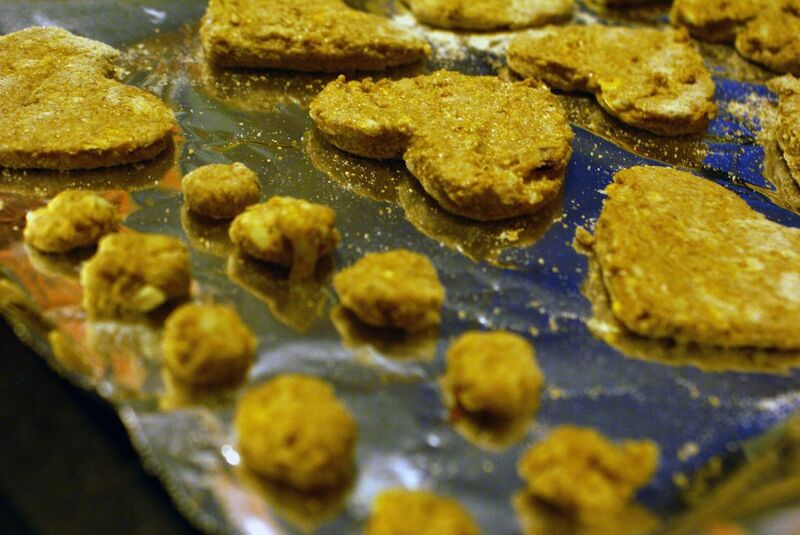 These biscuits have been tested (and found to be a delicious treat) by both dogs and rats! I'm sure that your cat, hamster, guinea pig, dog, or rat will love these! I'm putting mine in doggie bags for friends and family with pets! They make great gifts! I filled up my pan twice with this recipe, so it will make a lot of them. Bacon, banana, peanut butter, dog food, etc. Step 2: Mix Wet Ingredients Into Dry Ingredients. Before you mix, preheat your oven to 350. Start by mixing your dry ingredients, first. Mix the flour, cheese, oatmeal, and any other dry ingredients you feel like you should add. Fold in the wet ingredients. When I added all of my wet ingredients, it was way too sticky, so I added a little extra flour. I changed my recipe from needing 2 cups of whole wheat flour to needing 2 1/2 cups. It made it perfectly doughy. If you wanted to add ingredients like banana, add it in with the wet ingredients. For bacon, add it in with the dry ingredients, or after it is all mixed together. Roll out your dough. You may need to use flour on the surface of your counter, rolling pin, and cookie sheet. Cut the shapes you want, if you decided to use a cookie cutter. I'm giving the larger, heart shaped treats to my parents dog, Jack, because he is a big, pit-bull/lab mix, so the bigger treats aren't completely a bad idea. You can also just pull little pieces off from the dough and roll it in your hands to make smaller biscuits. I make teeny tiny ones for my rats! I used aluminum foil on my cookie sheet to keep from sticking to the pan. You can also lightly grease the pan. Bake for 15 minutes, flip them if you can after 7 or 8 minutes (they may be stuck to the foil). Let them cool before you take them off the pan to keep them from breaking in half or sticking. If you have little gift bags, you can use those, but I just used plastic wrap because I had it on hand. I just split the biscuits into three stacks for the three people I'm giving them to, cut a piece of plastic wrap big enough to wrap around the stack, and tied ribbons around the top. These make the perfect gift for any pet owner! Dogs don't have much lactose so they cannot digest dairy. Looks like a dog will like it. great idea for the fur kids... remember that many dogs are allergic to wheat. thankfully there are tons of alternatives. baby food can also be used but watch out for chicken and beef stocks with onion & garlic. Wow, I didn't know that! Thanks! just be careful on how much cheese you feed your dog as can cause stomach upsets. I ended up with about 52 treats total, with only a cup of cheese, so I don't think that's too bad. Thanks for your concern, though! I'll Jeep that in mind when feeding them to my rats! I bet my dog would love these! I hope so! I gave one to my neighbor's dog last night and he came right back for another!